Safer sources of power on CTA property are the outlets along the platforms of el stations, the covers of which are often unfastened. Metra commuters enjoy a number of niceties that aren't available to CTA straphangers: padded seats, onboard bathrooms, the right to savor an adult beverage during the ride. To that list of Metra perks add the ability to legally charge cell phones and other electronic devices in stations and aboard the bi-level trains. The agency announced in December that riders can power up their gadgets for free at new charging stations in all five downtown depots, which also offer complimentary Wi-Fi. Located near ticket booths and waiting areas, the outlets have wall-style sockets as well as USB ports. 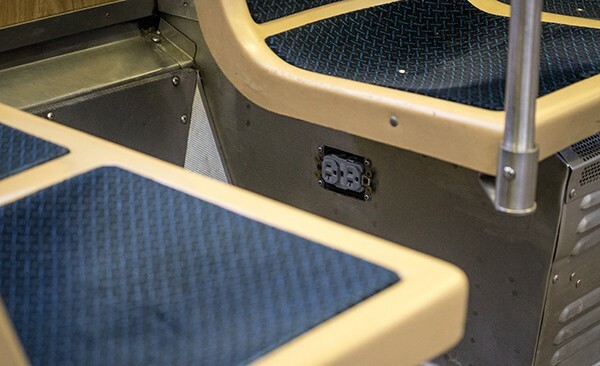 Some Metra rail cars already have outlets customers are welcome to use, and the newest batch of coaches features sockets adjacent to many of the seats, and renovation crews are in the process of retrofitting older cars with sockets. Meanwhile, the poor slobs on the el are forbidden from accessing the juice at stations or on trains. "The use of electrical outlets on CTA property is not permitted," agency spokesman Jeff Tolman says. "Charging stations is one idea among many customer amenities we're exploring as we seek ways to improve service." Older el cars feature an outlet located in each car under the aisle-facing seats closest to the semi-private corner opposite the enclosed booth intended for the train driver. Even if you're not going to let a little thing like the law stop you from topping off your iPhone, the new 5000-series rail cars (the ones you love to hate, with mostly aisle-facing seats) don't have accessible outlets. The older 2600- and 3200-series models, which have a higher number of forward-facing seats, still feature an outlet. It's located in each car under the aisle-facing seats closest to the semiprivate corner opposite the enclosed booth intended for the train driver. These sockets are meant to be used only by CTA cleaning crews, and the agency began installing locking covers on them a few years ago. Still, the outlets often remain exposed; the cover for an outlet on a Blue Line car I rode last week wasn't secured. Tolman claims access is pointless because the electricity doesn't flow to those sockets unless the trains are being cleaned. "Outlets located in rail cars are turned off via the electrical breakers while the cars are in service," he says. However several commuters I talked to say the power is occasionally available for a quick charge. "I've occasionally discreetly used the outlet on certain CTA cars under the sideways facing seat," says computer programmer Gareth Newfield, a Logan Square resident. "But they don't always work." 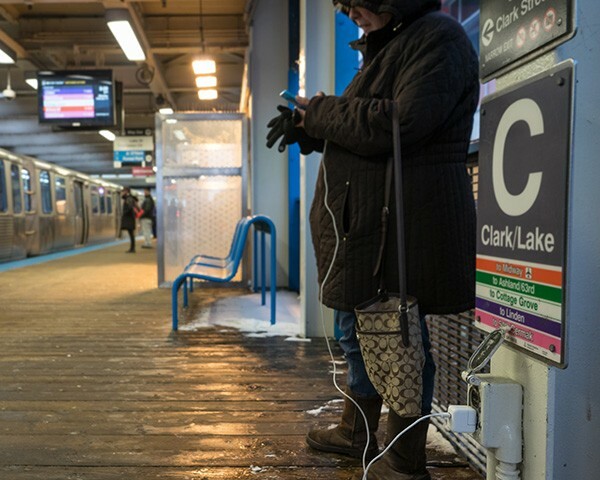 "The outlets are left in the off position unless being used by CTA personnel," Tolman insists. "If an outlet may have accidentally been left on, the use of the outlet is not only against CTA policy, it could also potentially damage a device." Safer sources of power are the outlets along the platforms of el stations, the covers of which are often unfastened. While that method is still prohibited by the CTA, at least you don't run the risk of a third-rail power surge barbecuing your expensive gadget. Could woman-only el cars prevent sexual harassment on the CTA? It's worked in Mumbai and Tokyo, but the CTA says education is a better strategy. Some neighborhood residents are bitterly opposed to the project, which proponents say is essential for meeting future Red Line demand. Rahm's schools CEO is putting a new spin on an old Chicago budget trick.